Andy Peaks says he will find out which AFC Rushden & Diamonds are “ready to go into battle” during training this week. 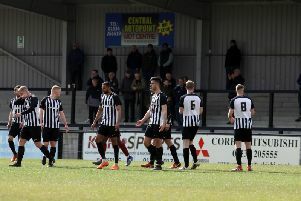 Diamonds’ Evo-Stik Southern League Division One Central title hopes suffered another setback as they were beaten 1-0 at Potters Bar Town on Saturday. It was a second defeat in a row for Peaks’ team who now only top the table on goal difference while the chasing pack, which is headed by Kings Langley, have games in hand on them. Diamonds are now preparing for a home clash with Barton Rovers on Saturday. And while Peaks is struggling to find out why his team are under-performing at such a crucial stage of the season, he insists he will “deal” with the situation. “I can’t really put my finger on it,” Peaks said when asked what has gone wrong for his team. “I don’t know whether it’s the pressure or what. But what I do know is that as a player and as a manager, I have always prided myself on a good work ethic. “We had the defeats to Chalfont St Peter and Egham but we performed well and did everything we could to win. “But that wasn’t the case on Saturday and it was similar to what happened at Beaconsfield. “I will deal with it and get people in who going to fight for it because that’s what I need at the moment. “All of these players have been good for us but some of them are getting found out. “I am looking for a massive reaction and we will be training very hard on Tuesday.